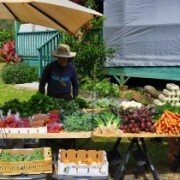 “Every Saturday from 9:30 to Noon there is a community farmers market at Hale Halawai. Local farmers bring fresh produce and local artisans display their crafts. There are also several food booths offering healthy drinks and yummy prepared foods. It is an event that brings residents and visitors together to support the local economy.